Review by Subaru45 of central Wyoming. I find that the views are very good, with clear and sharp stars. Good FOV using a 10" f/5 reflector, focuses well, dark background, good quality overall. The only problem I had was at times I would encounter blackouts while trying to hold my eye position and deal with neighbors light coming in from the side. Over all I am very pleased. Review by staryeyed of White Mountains, AZ. I had a few eyepieces but they all had a very short eye relief and only the center 1/2 of the field of view was clear. This eyepiece works from center to the edge with a clear, sharp in-focus image. The eye relief is fantastic. This is always the first eyepiece I put in my focuser every time I go out to look at the stars. The nebulas and clusters look fantastic with this eyepiece. I am new to the hobby of astronomy. Bought a used 5 inch reflector with two eyepieces. Both are inadequate though they came from name brand manufacturers. This 21 mm eyepiece was between the two I had and after 2 nights use, one on my scope and one on another scope I am convinced this is as good as it gets till I can upgrade to a much larger scope. I am ordering a second one about 7 mm today. 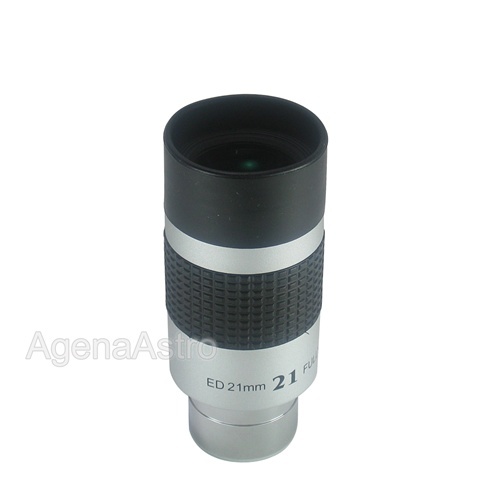 I have shown this eyepiece to several friends and they too will be ordering this eyepiece.